In the past 35 years, hundreds of our water storage tanks have been installed throughout Texas and the southwest. Our tanks are the perfect complement to your home or ranch property. Our versatile tanks work flawlessly for potable water, irrigation, livestock and ranch uses, and for rainwater catchment. Our tanks can also be designed with a wide variety of beautiful exterior finishes and sizes to meet your design needs. For a lifetime of beautiful durability, nothing beats a C&M Precast Water Storage Tank. 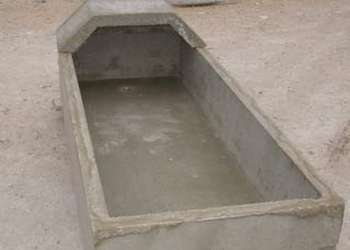 Our precast water troughs come in a variety of shapes and sizes to fit your needs.